LM3876 is a high performance audio power amplifier IC from National Semiconductors. The LM3876 can deliver 50watts of output power into an 8 ohm loudspeaker. 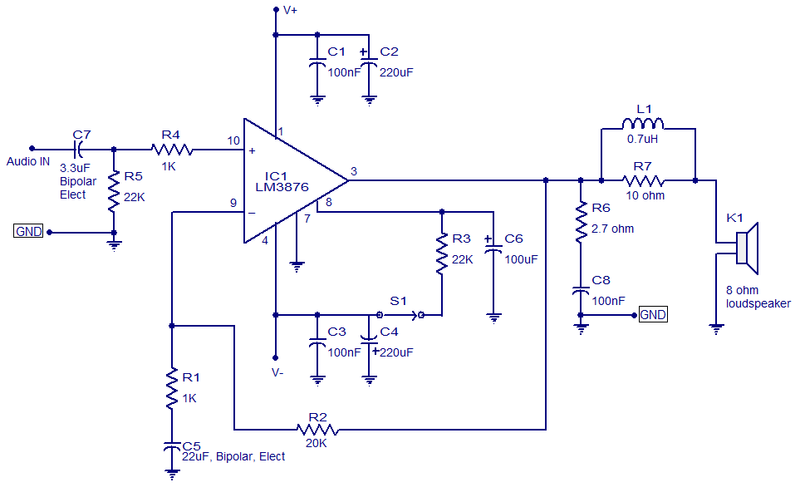 LM3876 has excellent signal to noise ratio and has wide supply voltage range. Other features of LM3876 are output to ground short circuit protection, input mute function, and output over voltage protection, etc. Applications of LM3876 are component stereo, compact stereo, surround systems, self powered speakers, etc. The 50 watt audio amplifier Â circuit shown below is designed based on the application diagram from the data sheet of LM3876. Some modifications are made on the original circuit for improving the performance. The bipolar electrolytic capacitor C7 is the input DC decoupling capacitor. R4 is the input resistance. R2 & R1 and bipolar electrolytic capacitor C5 forms a feedback circuit. C2, C1 are filter/by-pass capacitors for the positive supply rail. C4 & C3 are the filters/by-pass capacitors for the negative supply rail. The feedback resistor R2 sets the gain of the amplifier. L1 provides high impedance at high frequencies so that R7 may decouple capacitive loads. R3 is the mute resistance which allows 0.5mA to be drawn from pin8 to turn the mute function OFF. S1 is the mute switch. Resistor R6 and capacitor C8 forms a Zobel network which improves the high frequency stability of the amplifier and prevents oscillations. The LM3876 can be operated from a supply voltage range of +/-12V to +/-49V DC. I recommend +/-35V DC for powering the IC. LM3876 requires a proper heat sink. Sir, can i power this circuit using 12 0 -12…….. i am searching for a car amplifier for a 40 W speaker, is this one is suitable. Sir how much power can i expect frm this circuit when i Use a 24 0 24 Power supply? I have a dual power supply of 35-0-35 v. But, the ampere rating of that power supply is 3 Amperes. Will this circuit work on that power supply?? Or the current provided will be high enough to burn the circuit?? Hi led950 this circuit is a proven amplifier design. you can take for granted and proceed with the construction, taking standard care in the layout etc. will it work with 24v 0 24v current? Hi lcd950 please go through the notes given below the circuit it can work on any voltage from +/-12V to +/-49V DC, both – & + potential should be identical in value. i want the complete power supply circuit design for this circuit with +35V & -35V for its best working. Please give mi this circuit by mail or if possible publish here. It’s amazing to have this at time, hope to use in my project……………. orry for the small mistake. use the following circuit we will change it soon. No IC LM3876 amplifier here. Just a 50 watt mosfet amplifier instead.